Since the day the second generation SCENARs (or SCENAR devices incorporating COSMODIC ® technology) came to existence on the rise of this century, their unquestionable benefits very quickly placed them on our “top-selling” list. They stayed there ever since gradually and naturally replacing the first generation SCENAR devices. How Do I Choose The Right SCENAR FOR ME? Imagine… “EX735Ag Modific I will have at home for my family, EX715Ag — specifically for my wife, PS705Ag I will keep in my car, PS705mini I will give to my kids, to smooth over school bruises, and the most “biting” — VX735, will be for my mother-in-law. And The DOVE for granny. And everybody is happy!” Nice dream, isn’t it? And nothing like that in real life. However… when you have a SCENAR device at home, sooner or later you will want another one, or two… that is for sure. It is not because you are greedy; it is because you are confident in this device, as you already know that it will always help. With time, being without a SCENAR seems unthinkable. You will always have it at hand: when you travel, when you go on holiday, when you are at work. This is the undeniable truth. But the question remains, which device is the best? I cannot give you an answer. I have spent 37 years creating SCENAR devices… for me, they are all my children… how can I tell? Each of them has its own charisma. Why do we have so many of them? Yes, the unique SCENAR device can help in all situations and treat all diseases, but…. it is not yet a panacea for ALL health problems you may have, even though we all would love it be so! That is the reason we have them so many — altogether they are quite something! 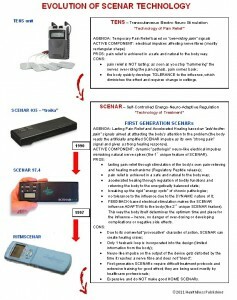 Certainly, the choice of a SCENAR/COSMODIC ® device is very individual. There are no standard solutions. When asked for advice, we always try to match a particular device to the ecology of our client’s life and health and even to his/her personality. Sometimes, it almost feels like matchmaking – and for a good reason. We are actually matching two complex systems, which, if compatible, together create a qualitatively new union, where the whole becomes much more than the sum of its parts. In this situation 1+1=11, not 2 – and that’s where the healing miracles become possible. I’d like us to be clear on what you are actually acquiring by purchasing a SCENAR device. You are not just buying a sophisticated piece of electronics, a new gizmo, a tool, or even a magic wand that is going to make you healthy. You are getting A TRUE FRIEND. Actually, this is not just a pretty phrase. We are talking about the essence of things. What is ‘a true friend’? I presume, this question, for most of us, is associated with the image of a dog – the embodiment of unconditional love. No matter how good, bad, or ugly you are, a true friend accepts you unconditionally; you can count on him under any circumstance. Your true friend shares your happiness – and it doubles. He shares your troubles – and they become half the size. But more importantly, your true friend always wants the best for you, which often means reflecting back to you your incoherence and imperfections, so that you, in your new found awareness, can correct them and become happier. 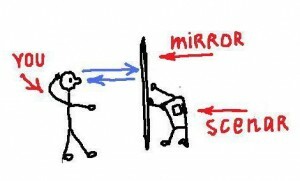 What you sometimes see in your friend’s eyes may not be a pretty picture – and yet where would you be without this honest mirror? And that’s precisely what you are getting with a SCENAR device – your body’s truthful mirror (as we all know the feedback feature in SCENAR makes it possible). 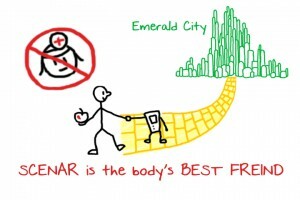 SCENAR becomes your universal companion, an unconditionally devoted and intelligent Personal Health Assistant (PHA) you can count on in any circumstances, which also like that famous apple a day can keep the doctor away. 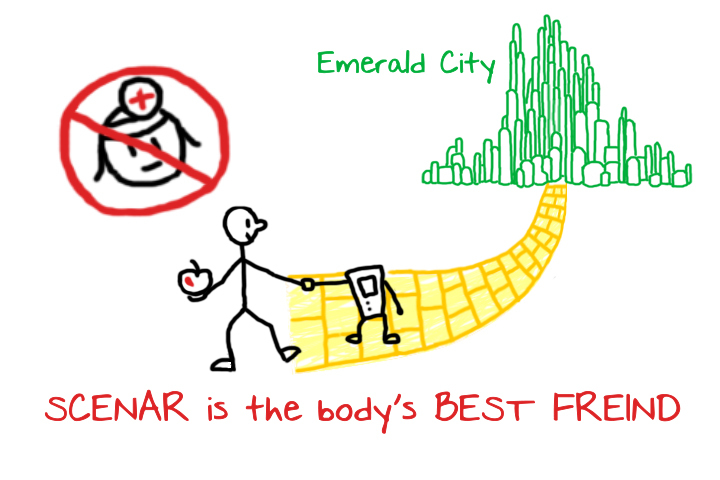 In other words, SCENAR is the body’s best friend (sounds almost like a song lyric…:-)). Any SCENAR owner can share with you that shortly after you get your first SCENAR in your hands it becomes an extension of you. This little electronic wonder amplifies your innate ability to heal and facilitate healing in others. It makes you a healthier, happier, and overall better being on more than just the physical level. All this I know first-hand. It happened to me about 14 years ago, and since then I’ve seen it happen to so many others. And you know what I want the most? That EVERY LIVING SOUL on Earth experiences this wonderful transformation from a slave to their diseases and a ‘patient’ object of someone else’ expertise into the master of one’s own physical, mental, emotional, and spiritual health and, consecutively, destiny. The transformation to Your Own Health BOSS. From my point of view, SCENAR is one of the very few technologies known to mankind that is instrumental in this transformation. That is, if you found the right match between a person and a device. SCENARs, as living systems, have personalities and certain ‘signature vibrations’. The latter differ among various models – and even in single devices of the same make and model. Actually, the more sophisticated the SCENAR device, the more ‘distinctive’ its personality – and the more difficult it is to match (just like with any living system). The easiest to deal with are CHENS (TENS) devices – the simple low frequency electro-stimulators sometimes called ‘SCENARs’ for marketing purposes, or ‘the hammers’. They are the most universal and work in virtually any situation for what they are intended, i.e. TEMPORARY PAIN RELIEF. Matchmaking is not needed here. If your goal is to mute the body, blocking its cry for help for a while so that you (or your client) can continue functioning and living in an illusion that everything is all right, then the CHENS ‘SCENAR’ is your pal. It will do the job – and, from my point of view, it is much better to use this type of pain relief than to swallow a pill. Just be honest with yourself and clearly realize that this is all that the first zone ‘SCENARs’ can and will do for you. Do not expect CHENS to facilitate a healing miracle; you are going to be disappointed. The first zone device will not help you reverse fibromyalgia, or arthritis, or grow a new spinal disc. It will not get to the cause of your headache – but it can relieve the headache for a few hours, letting you finish an important task. What do I want to use the SCENAR device for? The DOVE (Device Organizing Vital Energy) is the scenar technology at its finest and the top of scenar evolutionary tree. 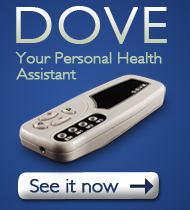 Don’t be misled by its simple look – The DOVE is your universal health assistant that is highly effective, reliable, and user-friendly. The DOVE is the last and the best scenar designed by “the father of all scenars” Dr. Alexander Karasev, who called The DOVE “a true scenar”, or “a scenar as it should be”. COSMODIC ® is the latest in the evolution of scenar and the first energy-healing technology that is capable of helping you to not just heal, but actually RE-GENERATE. We call COSMODIC ® devices “second generation scenars”. 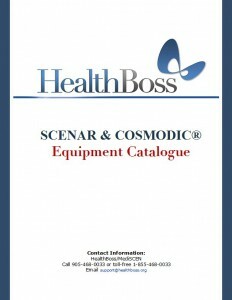 If scenar listens to the body on 1 channel, COSMODIC ® listens on 46. It collects a lot of data and then builds a mathematical model of where the body is, calculates where it should be – and leads the body to REGENERATION. It is even capable of determining the exact moment when cells switch to the regeneration mode (the “DOSE”). Multidimensional and rich in information COSMODIC ® signals come in bundles (called adaptive regulatory bundles), which both stimulate and sedate the body, mimicking the signals of the central nervous system. COSMODIC ®works like a skillful coach, gently and tactfully guiding the body to its best performance. It works both directly through the Central Nervous System and through local mechanisms to awaken and enhance the inherent capacity of the body to recover and rejuvenate on a cellular level. If scenar can help you heal “like nothing ever happened”, COSMODIC ® will make you better than pre-injury (disease) – “as you SHOULD be”. COSMODIC ® technology is highly sophisticated and sensitive – yet it is very simple in operation and user-friendly. It is also expensive – and it is well worth it. COSMODIC ® is represented in the C-DOVE, the 705m, the 715, and the EX735 Modific (including the Slider version) devices, all manufactured by LET Medical Research Laboratory in Russia led by Dr. Alexander Karasev. The EX735Ag Modific (including the Slider version) is a professional model that contains both scenar and COSMODIC ® technologies, along with a sensor system that automatically determines which of the two technologies is most appropriate in the area you are treating. It also can be manually regulated, which allows for maximum user friendliness and flexibility. 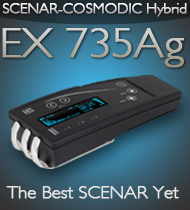 The EX735Ag Modific is aalso ideal as a personal device because of its highly automated functioning, which requires little knowledge to obtain excellent results, but also has the depth of features and exceptional quality of components that satisfies the most discriminating professional practitioner. This is the very best of scenar devices available in the world today – a profound addition to the emerging field of medication-free treatment of disease and disease prevention. The EX735Ag Modific is capable of stimulating the body’s own healing capacity at such a fundamental level that it holds the potential to revolutionize how healing and medicine are approached. This device embodies a level of healing technology that now makes obsolete much of what conventional medicine does. This huge step in medical advancement makes the idea of everyone having a “hand-held doctor” in their home a reality. To your knowledge is there a qualified practioner in Indonesia or Singapore as my son is in need of some treatment. He is a resident (expat) in Jakarta. I would like to know which model is the best for healing insomnia, depression. It is for personal use. Any model of SCENAR or COSMODIC device can help with insomnia and depression. It is not the model that matters; it’s how you use it. There are protocols that would address both issues through balancing the activity of the Central Nervous System. In our opinion though COSMODIC devices are easier in personal use, since they are fully automatic. 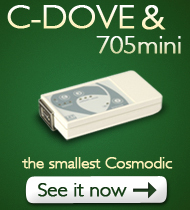 We are sure, something like the C-DOVE or the DOVE scenar you may find very helpful. Kindly advice how to use this cosmodic scenar and price to purchase for medical centre use.